Today only, Sprint customers can pick up the Apple iPhone XR for as low as $364.99 from Best Buy. Time is of the essence here, but you need to trade-in an Apple iPhone 7 Plus or newer model. While the actual amount of the trade-in will vary, the $364.99 price reflects a $225 value being placed on your trade along with the $160 discount being offered on the phone by Sprint. 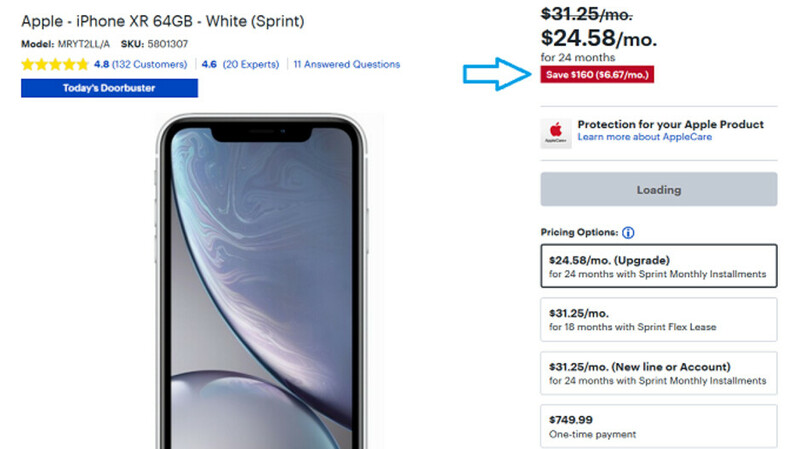 Subtract the $385 from Best Buy's $749.99 price of the 64GB iPhone XR takes the price down to $364.99. The phone must be activated today. Verizon customers can pick up the iPhone XR with the same trade-in offer for $424.99. That reflects a $100 discount being offered by the carrier. AT&T customers will only get up to $225 depending on their trade-in. That means that the best AT&T customers can hope for is a price of $524.99. But earlier this month, Apple responded to weaker than expected sales of the device by offering the iPhone XR for as low as $449 with the trade-in of an older iPhone model. It really all comes down to the iPhone model that you're trading in. Remember, this deal only has a few more hours to run, so if the 64GB iPhone XR is the phone you want, you should consider taking advantage of this deal now. 64 gigs is the new 16.
instalment payments for a phone is ridiculous, if you can't afford a phone paid in full then you should not use instalments to have it and curiously, the rich apple users have started this trend, maybe they are poor like android users. What nonsense. I assume your same philosophy applies to homes... if you cant afford a home, you should not use a mortgage, you should buy it outright yeah?? The whole world's economy is built on debt and loans. It's not a bad thing, it allows you to enjoy nice things earlier in your life. It buys you time, the most important asset of all. Ok, but I just said 64 is the new 16. Please stop with these clickbait deal articles. These deals all hinge on trading a phone in, not actually getting it for that low price.